This article demonstrates how you can change the default look of the RadCartesianChart series. 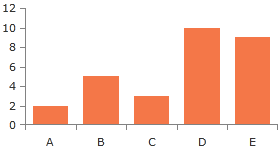 The different chart series use different visual elements to display their data points - a bar, an ellipse, etc. You can apply a custom style for those elements via the DefaultVisualStyle property. The property accepts a value of type Style which targets the visual element of the corresponding series. There is an additional DefaultVisualStyleSelector property which can be used to apply different style for the different data point visuals in a series. Since Q1 2016, all Cartesian series (excluding RangeSeries) are rendering default visuals using the DefaultVisualStyle property. So, you can use it also with line and area series to display their data point visuals which don't exist by default. Note that when using line or area series you will need to set also the size of the visual. Otherwise it won't be displayed. When using a Palette the series' default visual will ignore the color defined in the DefaultVisualStyle and it will use the one provided by the palette. All series supported by the RadCartesianChart expose a PointTemplate property. It is of type DataTemplate and gets or sets the template that describes the visual representation of the data points in a series. There is an additiona PointTemplateSelector property which can be used to apply different visuals for the different data points in a series. Using PointTemplate is recommended only when the DefaultVisualStyle cannot be used. This series expose the DefaultVisualStyle property. It is of type Style and determines the appearance of the Path element used to visualize the PointSeries. Your custom style should target the native Path component. This series expose the DefaultVisualStyle property. It is of type Style and determines the appearance of the Path element used to visualize the ScatterPointSeries. Your custom style should target the native Path component. Since R1 2016 the chart's line series have default visual elements for their data points. This means that you can use the DefaultVisualStyle property to customize the data points visuals. This series expose the StrokeShapeStyle property. It is of type Style and determines the appearance of the Path element used to visualize the LineSeries. Your custom style should target the native Path component. This series expose the StrokeShapeStyle property. It is of type Style and determines the appearance of the Path element used to visualize the SplineSeries. Your custom style should target the native Path component. This series expose the StrokeShapeStyle property. It is of type Style and determines the appearance of the Path element used to visualize the StepLineSeries. Your custom style should target the native Path component. This series expose the StrokeShapeStyle property. It is of type Style and determines the appearance of the Path element used to visualize the ScatterLineSeries. Your custom style should target the native Path component. This series expose the StrokeShapeStyle property. It is of type Style and determines the appearance of the Path element used to visualize the ScatterSplineSeries. Your custom style should target the native Path component. StrokeShapeStyle - it is of type Style and determines the appearance of the series. Your custom style should target the native Path component. AreaShapeStyle - it is of type Style and determines the appearance of the area, locked between the axis and the line. Your custom style should target the native Path component. StrokeMode - it is Enumeration type and determines how the RangeSeries area outline should be painted or not. By default is set to LowAndHighPoints. RangeSeries expose several additional properties you can use to style its appearance: Stroke, StrokeThickness, Fill, DashArray. This series expose the DefaultVisualStyle property. It is of type Style and determines the appearance of the series. Your custom style should target the native Border component. This series expose the DefaultVisualStyle property. It is of type Style and determines the appearance of the series. Your custom style should target the native OhlcStick component. This series expose the DefaultVisualStyle property. It is of type Style and determines the appearance of the series. Your custom style should target the native Candlestick component.